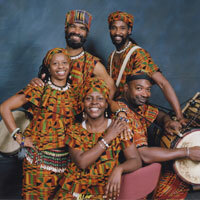 Bird Fleming formed The Traditional Music Society, an arts organization devoted to multi-cultural arts education. This organization, composed of musicians and dancers sharing a similar background in folk music, has developed programs that teach students about different cultures through music and dance. Bird developed his interest in music and drumming in his fifth grade band class. Since his parents could not afford a drum set, he played the bongos. By the age of 20, Bird was proficient in a variety of African and Afro-Cuban instruments. His career then led to him San Francisco where he performed and studied traditional hand drumming. After moving to Kansas City in 1981, Bird began performing traditional music in schools, community centers, and universities throughout the metropolitan area.